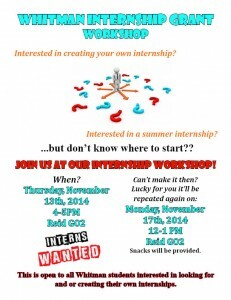 Don’t miss our Internship Workshop on Thursday, 11/13, 4-5 pm in Reid G02 and if you can’t make that come to the one on Monday, 11/17, 12-1 pm, Reid G02! 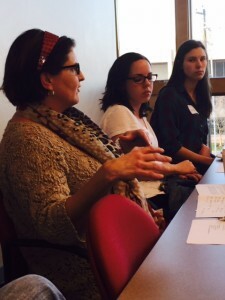 Interested in education? Want to teach in high-need schools and communities while getting a graduate degree at the same time? 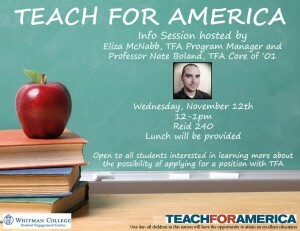 A D.C. based Teach for America Program Manager will join us via Skype on Wednesday, November 12 from 12-1pm in Reid 240 to share the tenets of the program and answer technical application questions. Also, Chemistry Professor, Nate Boland, will join the hour to share about his 3 year stint with TFA in Baton Rouge, Louisiana where he taught high school physics and chemistry. A soup/salad bar will be provided. 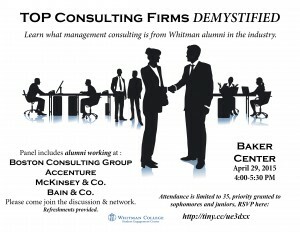 Bring a friend and come listen, engage and gather resources and options for your future endeavors after Whitman. 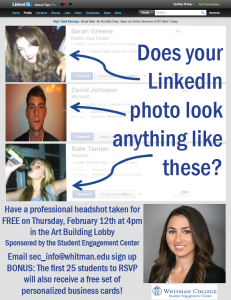 The Student Engagement Center is honored to host this information session which is open to all Whitman students.